HelloLeads is a sales CRM and simple lead management software which helps sales professionals to capture, track and manage leads efficiently. This simple and smart lead management solution offers you the tools and capabilities you need to drive engagement with your leads and potential clients at every opportunity, whether at trade shows, exhibitions (other marketing venues), field sales, social media marketing, and various other sources. HelloLeads lets you choose the best platform for your business. It offers a combination of web-based and mobile (Android and iOS) lead management for large-scale sales teams. If you run a small or medium-sized enterprise and your sales processes are performed by a single individual or different independent people, you can opt to manage, engage, and convert your leads with the HelloLeads mobile app. The product caters to B2B and B2C users. we still implement it makes the sales process even more efficient and successful, something to observe The Dashboard looks better in the web version than the mobile application. Jhon, Thanks for your valuable feedback. Easy to track leads and follow-upAdding of leads is easy and versatile. options to add from five different sources. Also, listing of leads is handy for easy follow-up scheduling. Adding of leads is easy and versatile. options to add from five different sources. Also, listing of leads is handy for easy follow-up scheduling. As a business owner and sales guy, i would want to have better analytics of the lead and the stages, which is missing in the my subscription and version. Dashboard is better viewed in web-version than the mobile-app. Karthikeyan, Thanks for your valuable feedback. ii) Deeper Lead Insights - HelloLeads provides options to capture not only the contact details but also deep value-added information like Potential, Customer Group (C-Group), Lead stage, their interest in your products, and planned budget. These insights can give your sales team a competitive advantage by improving strategies and addressing bottlenecks. iii) Optimized Email and Mobile Reminders - HelloLeads helps you take care of sending follow-up reminders for sales conversion through email and mobile. Through email, the tool provides an on-time follow-up reminder email with a link to the lead details. Meanwhile, mobile alerts are activated with an on-time follow-up reminder alarm. Additionally, you will be informed of every change in follow-up and activities through email alert and on the mobile app. iv) Track Lead’s Conversation History - Keep track of what you and your sales team have communicated with the customer in real-time. Capture or record your conversation or email details shared with your customer. You are also notified of every comment posted by you or your sales team via email. v) Informed Business Decisions - The Data analytics on Potential, Customer group (C-Group), Interest and Lead stage supports better Lead Tracking and provide actionable insights. This empowers you to make smarter, informed business decisions to improve your sales. vi) Sales Team Performance Tracking - Using filters in analytics enables you to generate sales reports by which you can keep track of who is generating more sales in the team. Hence, you can accurately monitor your teams’ efforts and encourage performance improvement on each member. 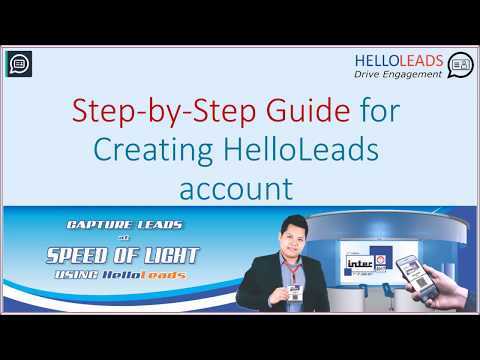 Below are some frequently asked questions for HelloLeads. Q. What type of pricing plans does HelloLeads offer? Q. Who are the typical users of HelloLeads? Q. What languages does HelloLeads support? Q. Does HelloLeads support mobile devices? Q. Does HelloLeads offer an API? Yes, HelloLeads has an API available for use. Q. What other apps does HelloLeads integrate with? Q. What level of support does HelloLeads offer?